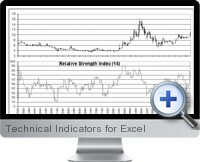 The Technical Indicators for Excel contain 26 technical indicators pre-built in Excel Spreadsheet format. These Excel files are useful for constructing securities trading, technical analysis, or statistical models in Excel. Technical Indicators for Excel can save research and calculation time, and each indicator is guaranteed to have 100% correct formulas. Technical Indicators for Excel can be combined to build sophisticated trading models that perfectly suit your particular investment criteria. All indicators are pre-built in Excel format with 'open source' formulas unlocked to enable easy adjustment and modification. The indicators cover 300 periods of data, and can be expanded as desired. Eliminates the time and expense of constructing the formulas. Easily combine indicators to build your own custom trading or analysis systems. Save money by eliminating recurring software and upgrade costs. Learn how each technical indicator works (a key for institutional audits and transparency). Modify the formulas to suit customized analysis needs. Exponential Moving Average: A responsive moving average that closely tracks price movements. The 'EZ-File' allows you to easily adjust the moving average length by changing a single variable cell. Regression: A linear approximation of price movements over time that is excellent for catching tops and bottoms. Triangular Moving Average (TMA): A moving average in which the middle values are weighted more than the early and late values to enhance smoothing. Sine-Weighted Moving Average (SWMA): A moving average using a sine factor to take into account both time and price movements. Very good at catching tops and bottoms, while filtering out unnecessary noise. Average Directional Movement Index (ADX): Measures the directionality of price movement over time to identify trending and non-trending periods. Vertical Horizontal Filter (VHF): Measures the directionality of price movement over time by capturing the relative location of price compared to its range in a set look back period. Simpler and more sensitive than ADX above. Commodity Channel Index (CCI): An indicator which measures price excursions from an average of the 11 previous price periods. Good for catching tops and bottoms. Percentage Price Oscillator (PPO): Similar to the MACD indicator, but normalized on a percentage basis for easy comparison across different securities. Stochastic Oscillator: A highly sensitive indicator used to catch tops and bottoms early. Williams %R: Measures the relative location of closing price in relation to the high-low range over a set time period. Standard Deviation: The fundamental indicator used to measure volatility over time. Bollinger Bands: Used to visually judge the relationship between price and volatility changes. Average True Range (ATR): Dynamically measures the typical range between price high/low/close over a set period. Moving Average Convergence-Divergence (MACD): An indicator that shows changes in the relative movements of shorter and longer moving averages. Good for identifying changes in momentum. Relative Strength Index (RSI): Measures price relative to past prices. The indicator is front-weighted for sensitivity, but filters out noise well. Chaikin Oscillator: This indicator combines both price and volume to measure momentum from a security's accumulation and distribution in the market. Momentum Oscillator: A simple indicator which compares later prices to earlier prices to gauge strength and momentum. Rate of Change (ROC): A simple indicator which compares later prices to earlier prices to gauge the speed and direction of price movements. On Balance Volume (OBV): This indicator adds and subtracts volume to a running total, depending on whether price moves up or down. A good confirming indicator. Money Flow Index (MFI): Similar to OBV, but enhanced by the addition of momentum characteristics based on relative location of price. Can be used as both a primary and confirming indicator. Accumulation/Distribution Line (AD): Measures the amount of buying and selling pressure by weighting it with the relative location of price. Chaikin Money Flow (CMF): This indicator enhances the usefulness of the AD by dividing a running total by a running total of volume. Percentage Volume Oscillator (PVO): This indicator is excellent for judging changing levels of interest and momentum in a security's movement. Percentage Price Relative (PPR): This indicator compares the relative price movements of two different securities or indices to help allocate capital better and give insight into future price moves. Inter-market Spread: Measures the gap between the prices of two different securities or indices to identify arbitrage or directional investment opportunities. Dual-Market Percentage Price Oscillator (DM-PPO): A Percentage Price Oscillator applied to the moving averages of two different securities or indices to identify tops and bottoms in directional momentum and strength.